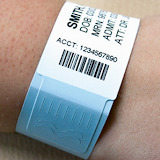 Developed specifically to meet the unique needs of health care providers, Zebra's reliable HC100 Thermal wristband printer is easy and cost effective. This solution combines the reliable HC100 direct thermal printer with easy to load cartridges containing the industry's only antimicrobial coated wristbands. Simply insert the individual wristband cartridge into the HC100 printer on demand. The HC100 printer detects wristband size adult, pediatric, infant and automatically calibrates its settings for optimal print quality.